1 How to brew tea with milk? 1.1 What is the use of tea with milk? 1.2 What is the harm of tea with milk? As known, traditional, authentic English tea has a very important secret - it is necessary to drink milk. The first Cup is poured milk, and then to tea, and in any case, not vice versa! Interesting, why it has developed such a method? He has some scientific basis and whether to drink tea with milk, or is it still bad? How to brew tea with milk? 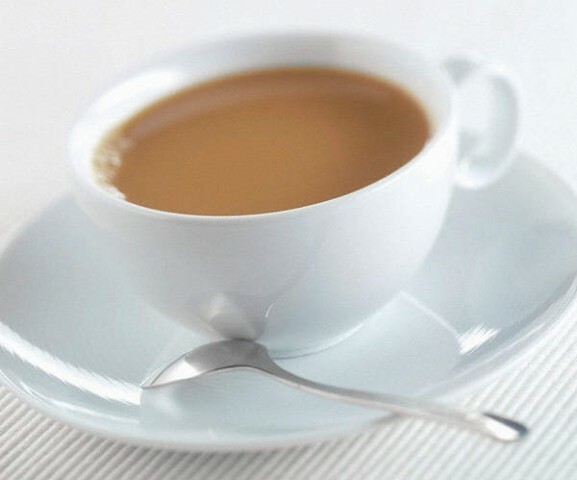 There are popular teas of certain varieties, eg, "English breakfast", "Irish breakfast", in which the blend is chosen so, to create a harmony of great taste with added milk to it. It goes well with milk and many other varieties of green and black tea. The first secret of tea with milk - It `s that, for him better to use fresh, low-fat milk or cream, and the first pour it into a cup, at the same time milk should be sure to cool. This fact is explained by the fact, that the milk must be cooled poured into it a hot freshly brewed tea, to prevent clotting of milk butter. This will prevent an unpleasant taste, that it can make tea. If you do the opposite, pouring milk in tea, the taste of tea is inevitably spoiled. And another secret: pouring tea into a cup of milk you need to slow, leisurely. The optimum 10% the proportion of milk in tea. What is the use of tea with milk? scientists, investigating properties of tea with milk, mark, that this combination very helpful and recommended to continue the traditional English tea party. The benefit is, what, First of all, milk will soften the effect on the body of alkaloids and caffeine, contained in tea. And secondly, tannin, contained in tea, softens the fermentation properties of milk, adversely affecting the gastric mucosa. Besides, Milk is a source of calcium, protein-lipid complex, and tea - source of B vitamins, folic acid and other mineral substances. In this way, tea with milk in alliance with each other and are allies in the fight for our health, in addition, it's just wonderful and very tasty drink. What is the harm of tea with milk? Somebody think, milk completely destroys the healing properties of tea, especially its benefit in heart diseases. they say, that is the conclusion the German scientists, A number of experiments on volunteers. However, these findings completely refute employees cardiology center in the UK, call into question the results from Germany, justifying it by the fact, that a group of volunteers consisted of only 16 person. Besides, research British scientists have proved, that the risk of cardiovascular disease is reduced by just the daily use and correct such a conventional method for brewing a beverage, like tea with milk.